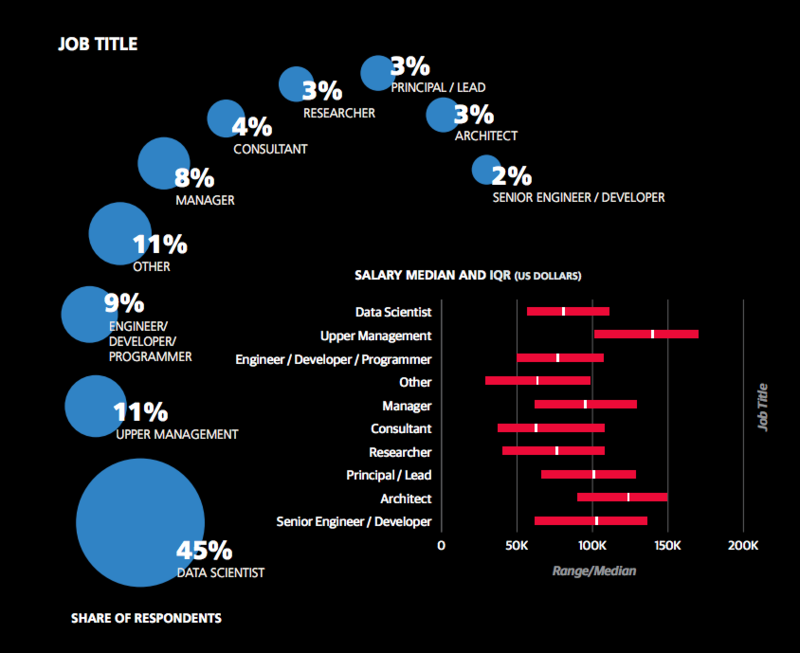 How Much Is a Data Scientist’s Salary? 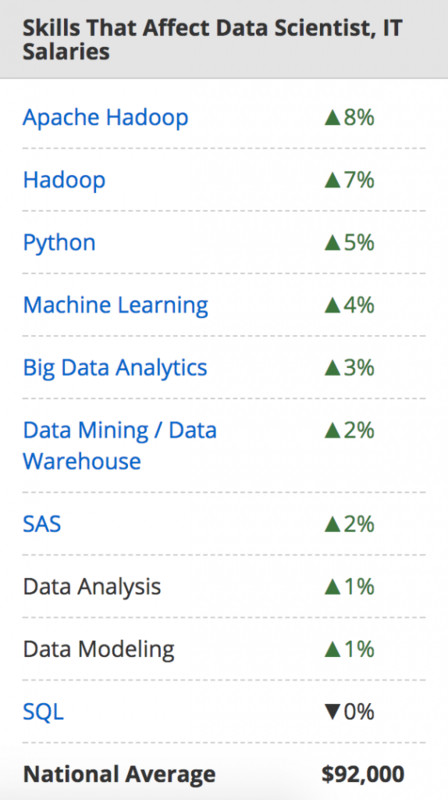 The average data scientist salary is $113,436, according to Glassdoor. The driving factor behind high data science salaries is that organizations are realizing the power of big data and want to use it to drive smart business decisions. And because the supply of data professionals hasn’t yet caught up with demand, starting salaries for these positions remain high ($50,000 to $95,000), especially for those who have an advanced degree in data science or a related field. How Much Can You Make as a Data Scientist? 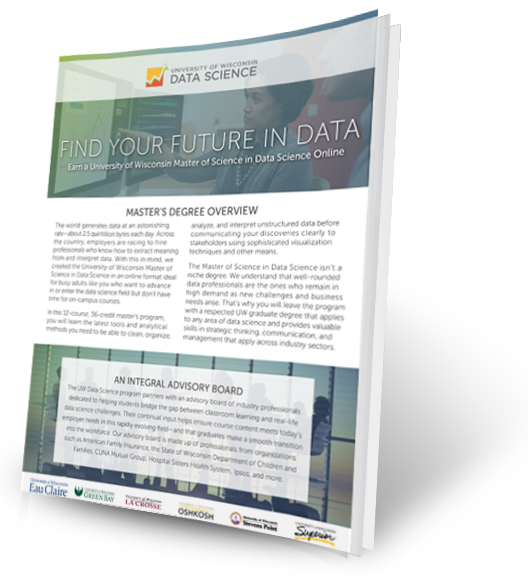 It’s no secret that data scientists can bring an immense amount of value to the table. Yet finding one person who can do all the tasks required of a data scientist is challenging, and competition over hiring these professionals is fierce. 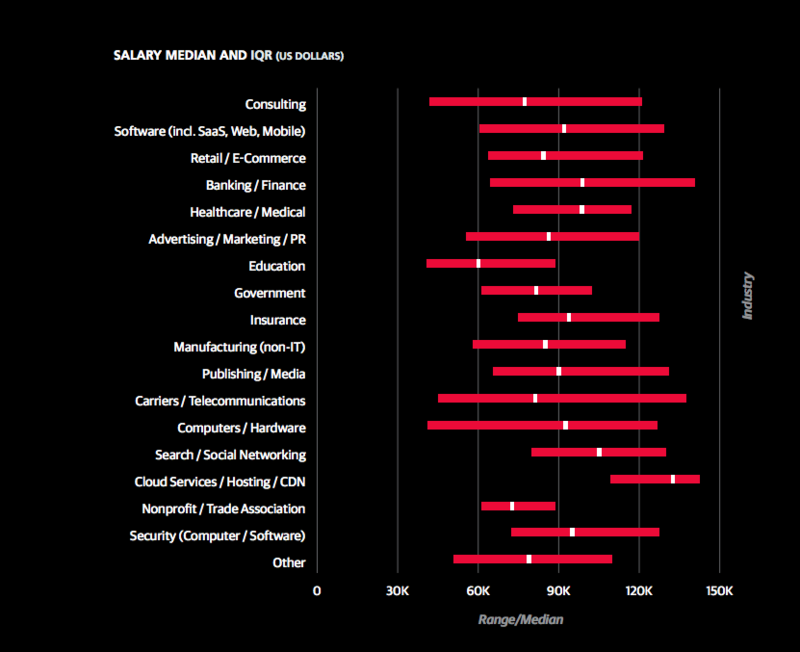 As a result, employers are willing to pay talented data scientists top salaries. According to O’Reilly’s 2016 Data Science Salary Survey, experience is one of the most important factors in a data scientist’s salary. For every year of experience, data science professionals make an average of $2,000 to $2,500 more. Entry-level data scientist salary. Despite a recent influx of early-career professionals, the median starting salary for a data scientist remains high at $95,000. Mid-level data scientist salary. The median salary for a mid-level data scientist is $128,750. If this data scientist is also in a managerial role, the median salary rises to $185,000. Experienced data scientist salary. The median salary for experienced data science professionals is $165,000—while the median salary for experienced manager-level professionals is considerably higher at $250,000. 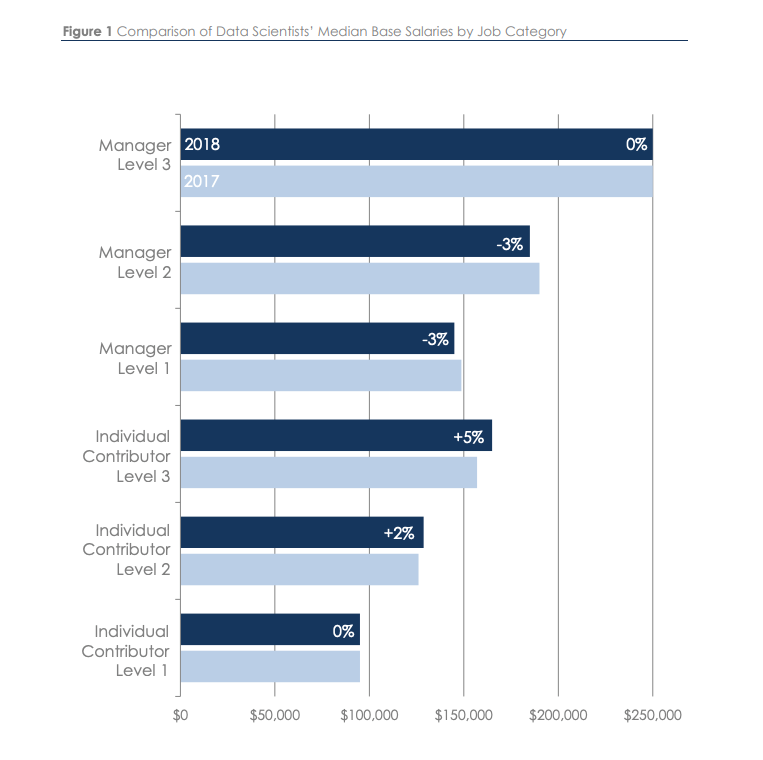 In O’Reilly’s data science salary report, 45 percent of those surveyed said they hold the title of “data scientist.” Another 31 percent said they are upper management; an engineer, developer, or programmer; or other. In general, the more a data science professional engages in managerial tasks—such as leading team projects, identifying business problems to be solved with analytics, or communicating with external parties—the higher the salary. Those with the job title of “data scientist” are generally experienced, expert-level professionals in data-driven organizations, according to datajobs.com. Data analysts work hands-on with data and tend to be at a point in their careers when they are focused on building up data science tools and skill sets. These professionals have one to three direct reports, sharp technical and quantitative skills, and strong leadership and business aptitude. Engineers can solve problems and drive business value by building the platforms and applications that data scientists use to perform data analytics. It’s important to note that only 12 percent of data scientists surveyed by O’Reilly in 2016 worked in these three industries. Nearly 30 percent worked in either consulting or software (SAAS, web, and mobile). 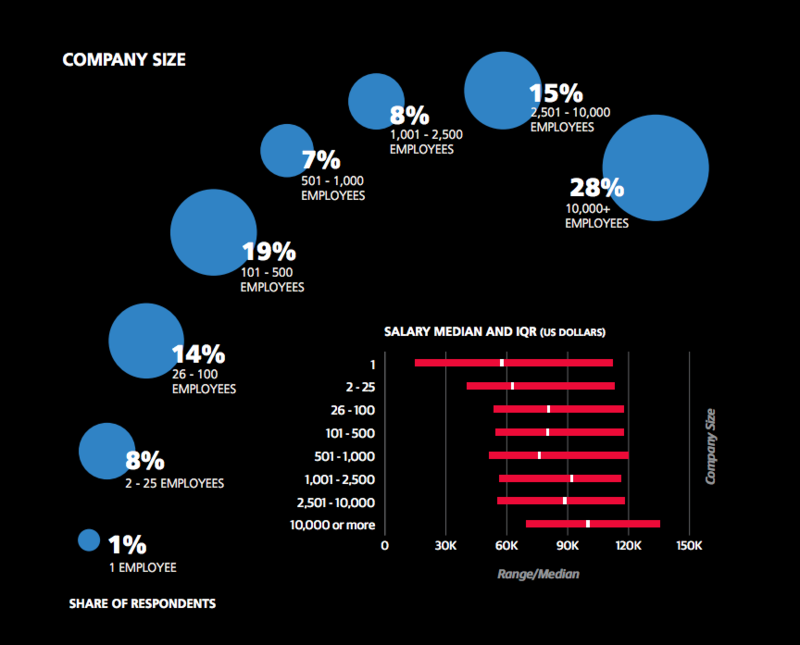 As far as company size, the larger the organization, the larger the salary. For example, in a company with at least 10,000 employees, a data scientist would likely earn a higher income than the same role at a company with less than 1,000 employees. Data scientists’ salaries depend greatly on the region in which they live. 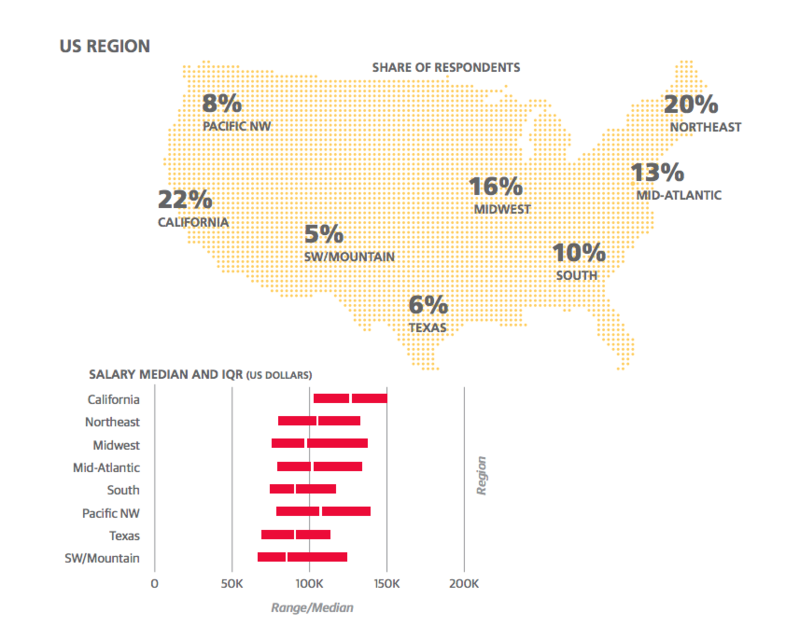 The highest salaries are in California, which is also where the majority of data scientists surveyed by O’Reilly work. The Pacific Northwest has fewer data scientists than most regions of the country, but it boasts the second highest salaries. Data scientists are rare, especially when it comes to having the right combination of education and skills. At the most basic level, data scientists must know how to write code. In fact, the highest data scientist salaries belong to those who code four to eight hours per week; the lowest salaries belong to those who don’t code at all. Data scientists also need to wield the technologies that tame big data—and be able to learn the new and emerging ones—as well as open-source tools, cloud computing, and data visualization. It’s not enough to simply know how to use these tools, however; it’s crucial that data scientists know how to use them to derive actionable insights that will improve their organization. Additionally, data science positions require sharp business acumen, scientific curiosity, and strong leadership and communication skills. Having them will greatly affect salary. Data scientists tend to have advanced degrees in quantitative disciplines such as data science, applied mathematics, statistics, computer science, engineering, economics, or operations research. But only a data science master’s degree will give you the precise education you need to be ready for a career in data science. University of Wisconsin offers an online Master of Science in Data Science. Start your journey. Curious about what you’d learn in UW Data Science courses? See the curriculum. Have questions about University of Wisconsin Data Science? Contact an adviser at 1-877-895-3276 or learn@uwex.edu.